Celebrate your special date, i.e. 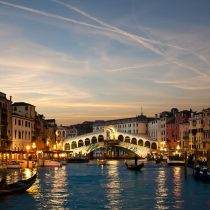 honeymoon, anniversary or marriage proposal in the most romantic city of the world at the Hotel A La Commedia Venice! At your arrival you will find a red roses’ petals shaped heart on top of your master bed and a fresh bottle of Champagne “Moet et Chandon Imperial” with fresh strawberries or chocolates. Then later we will pamper you at our bar with a typical venitian aperitif, the Rossini, and some snacks. Moreover the package includes discounted parking coupons for “Garage San Marco” and a visit to a glass-factory in Murano island.